I will destabilize Alberto's universe. Alberto Contador is not yellow. In an interview yesterday with Australia’s Sport&Style Magazine, Lance Armstrong confirmed what we learned in the 2009 Tour de France: Alberto Contador is incredibly tough — mentally. He was never afraid of big, bad Lance. 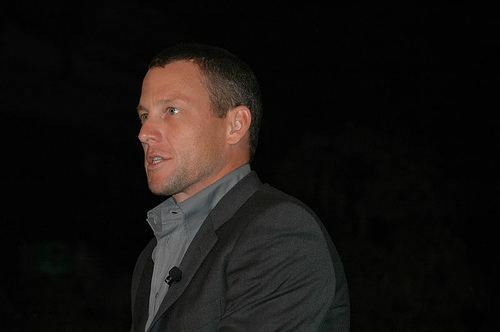 While admitting to manufacturing conflicts in the past (read Jan Ullrich), Armstrong said his feud with the Spanish climber was real and paid him the ultimate compliment. ”He is strong physically, but he is possibly even stronger mentally. He ain’t easy to disintegrate,” said Armstrong. You can be sure Plan D for Disintegration was in full effect during the tour. Armstrong is a master of the art of mental warfare. Many journalists predicted Armstrong would mentally wear down Contador. That if he couldn’t crack him in the mountains, he would break him down in the press, the team bus, at the team dinner table. The constant stress of his forced cohabitation with the Texan would take its toll and somewhere on the mountain roads of France, Alberto would run out of gas, exhausted by Lance’s psychological games — the tweets, the innuendo, the pasta-flinging, short-sheeting his bed. It never happened. That was the surprise of the 2010 Tour de France. Kid Contador was no kid — he had the legs and the head to beat Armstrong and Schleck. He was yellow alright, top step of the podium, kisses and stuffed lion for the second time. For Armstrong it must have been a shock to discover how many bullets El Pistelero had in the chamber. Vuelta winner and former Armstrong teammate Roberto Heras once said Armstrong wasn’t physically stronger than any of the top tour riders, he simply believed 100% that he would win. He was on another level mentally. It appears that Alberto Contador, at just 26 years of age, is at that level, too. Which means that in his quest, at age 38, for an astonishing 8 Tour de France victories, Armstrong is running out of drawing boards. Can’t beat Alberto physically and can’t beat him mentally. An insurmountable problem for every rider except the greatest endurance athlete of our time. Armstrong assembles his Tour de France think tank and they run the numbers. They look at the power outputs, wattage, time trial splits and the results of the mental stress tests Lance ran on Alberto. Conclusion: Contador cannot be beaten mano-a-mano. But the Texan has beaten a Big C before — there had to be another way. The brilliance of Lance and why he could run the universe if he was in the mood, is that he accepts the numbers. He immediately moves to the next level: teamo-a-teamo. Armstrong simply turned the equation upside down. New number: nine against one. Yeah, that sounds way better. In effect, Lance and Radio Shack director Johan Bruyneel decided on a new plan D. If they couldn’t destabilize the Spaniard, they’d destabilize his team. So they gutted Astana’s roster, performing an Astanadectomy that removed the top eleven support riders. This included podium finishers Levi Leipheimer and Andreas Kloden — not to mention the shoe shine guy. The Kazak bozos behind Astana were furious but the scenario was delicious: Armstrong and company driving the pace on the monster Col de Tourmalet climb and poor Alberto helpless and team-less. Even Contador’s compatriot, climber Haimar Zubeldia had jumped ship for Radio Shack. It was a ruthless, calculated move from Lance and former Astana director sportif Bruyneel — who had more than a few grudges to settle with Astana over what he claimed was their constant meddling and ingratitude for making Astana the top team in the world. Referring to Contador, Armstrong once famously tweeted that “there’s no I in team.” A few months later, there was in fact no team left to support the Spaniard in the 2010 Tour de France except doping pariah and wild card Alexander Vinokourov. That is the tactical plan for Radio Shack for the Tour de France. Isolate Contador in the mountains and attack. The genius of Armstrong is that he’s already isolated him about eight months early. Plan Destabilization done. « Placebo Galicia left off list of UCI approved Continental teams. Hey, Axel was a great rider but I wouldn’t compare him to Lance. Just kidding.